First, let me say that this is not your regular insulated backpack. 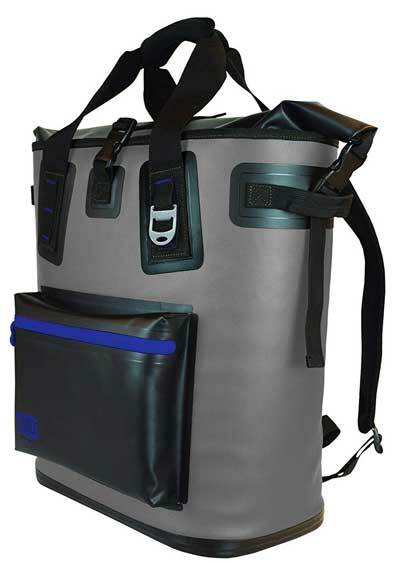 If you want a heavy-duty, super insulated and virtually indestructible bag, you’ll like the Built NY Cooler Backpack. In fact, Built NY has taken pretty much every measure to make this backpack cooler everything you’d want in a rugged insulated carrier. First of all, this pack has what the company calls “Freeze Lock” Insulation. In other words, the ultra thick 1″-1.5″ surrounding insulation keeps the cold in and the heat out. Second, the outer shell is constructed of super tough 1,000D Polyester. Imagine white water raft material sewn into a backpack. You’ve got a surface that resists holes, punctures, scrapes and more. 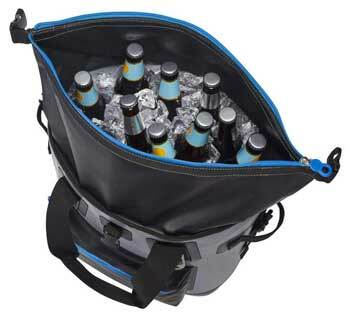 Hence, your drinks will stay safe, your cooler won’t leak and your backpack can essentially last a very long time. In addition to it’s abrasion-resistance, this rugged fabric won’t rot. Plus, it has a high tear strength and has a water-resistant coating. Third, the backpack’s liner-welded seams stop leaks. Not to mention, a no-leak liner helps keep the cooler from losing it’s “chill”. Therefore, you can carry a bunch of ice without having to worry about your backside or other gear getting drenched. Fourth, check out the wide mouth of this bag! Basically, the top opens wide, so you can set the backpack down when you finish hiking and treat it like a regular cooler. Not to mention, it makes filling the cooler easier too. You can easily reach it and grab drinks and find stuff without having to empty out the bag. Plus, this feature makes it very easy to clean the inside or simply turn the pack inside out to let it dry quickly. Fifth, you probably noticed that the bottom of the pack has extra reinforcement. This, of course, adds to the durability. But in addition, it helps create a stable, flat surface for the backpack to rest so that it stands up straight when you put it on the ground. 6. Pack Your Phone and Keep it Completely Dry! Sixth, you get a completely separate outer pocket for carrying keys, your wallet, sunglasses and more. Plus, it can even hold electronic gadgets like your phone because it is separated by a waterproof barrier from the cooler itself! Where before you might have had to carry 2 separate bags, now you can transport everything in one. Talk about coolers made easy! 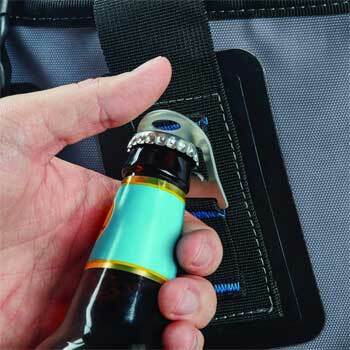 Seventh, I can’t help but mention the handy bottle opener on the shoulder strap. I mean, you know you will need it. Lastly, you can carry the Built NY Cooler Backpack comfortably (and conveniently) on your back due to the specially designed and padded shoulder straps. And, you’ll need it because the pack can hold more than 30 lbs of ice! Seams have box stitching, and the backpack has reinforced side handles. So, you can confidently pack on the weight! Compared to most other backpack coolers (or other soft-sided or plastic versions for that matter), the Built NY insulates better and will last longer. That said, it can cost up to 3 times as much. So is it worth the extra cost? That depends on how much you plan to use it, how long you want to keep drinks/food cold and if you need that heavy-duty strength. 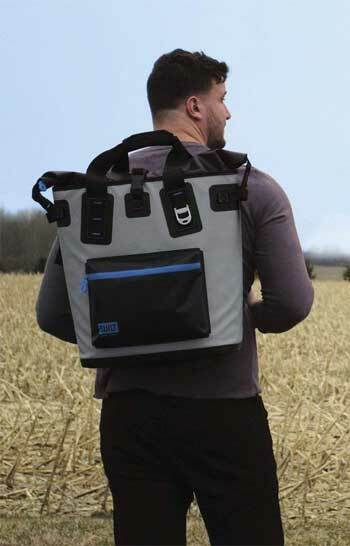 In summary, the Built NY cooler backpack holds up well in virtually any outdoor adventure. 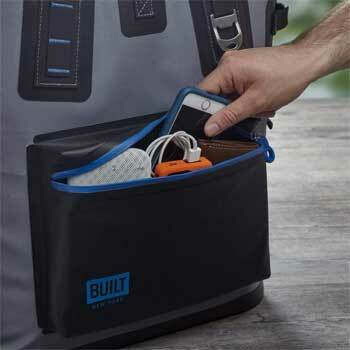 Of course, you can also use it at construction sites, tailgaters, picnics and more. Treat it like a portable mini fridge that doesn’t require electricity. How cool is that?